Daylighting describes the controlled use of natural light in and around buildings (Reinhart, 2014). It is the practice of placing windows, or other transparent media and reflective surfaces so thatnatural light provides effective internal illumination during the day. Successful daylighting requires design considerations at all stages of the building design process, from site planning to architectural, interior and lighting design. Daylight in buildings is composed of a mix – direct sunlight, diffuse skylight, and light reflected from the ground and surrounding elements. Daylighting design needs to consider orientation and building site characteristics, facade and roof characteristics, size and placement of window openings, glazing and shading systems, and geometry and reflectance of interior surfaces. Good daylighting design ensures adequate light during daytime. •	Direct sunlight is characterised by very high intensity and constant movement. The illuminance produced on the surface of the earth may exceed 100 000 lux. The brightness of direct sunlight varies by season, time of day, location and sky conditions. In a sunny climate, thoughtful architectural design is required, with careful management of allowance, diffusing, shading and reflecting. •	Skylight is characterised by sunlight scattered by the atmosphere and clouds, resulting in soft, diffuse light. The illuminance level produced by an overcast sky may reach 10 000 lux in the winter and as high as around 30 000 lux on a bright overcast day in the summer. In a cloudy climate, the diffuse sky is often the main source of useful daylight. •	Reflected light is characterised by light (sunlight and skylight) that is reflected from the ground: terrain, trees, vegetation, neighbouring buildings etc. The surface reflectance of the surroundings will influence the total amount of reflected light reaching the building facade. In some dense building situations, the light reflected from the ground and surroundings can be a major contributory part of daylight provisions indoors. The goals of room daylighting are to adequately illuminate visual tasks, to create an attractive visual environment, to save electrical energy and to provide the light needed for our biological needs. A good luminous environment is simultaneously comfortable, pleasant, relevant, and appropriate for its intended uses and users (Lam, 1977). Daylighting systems can be simple: from combining window design with appropriate internal and external shading (e.g. external awning blind and internal Venetian blind) – to systems designed to redirect sunlight or skylight to areas where it is required (e.g. sun tunnels). 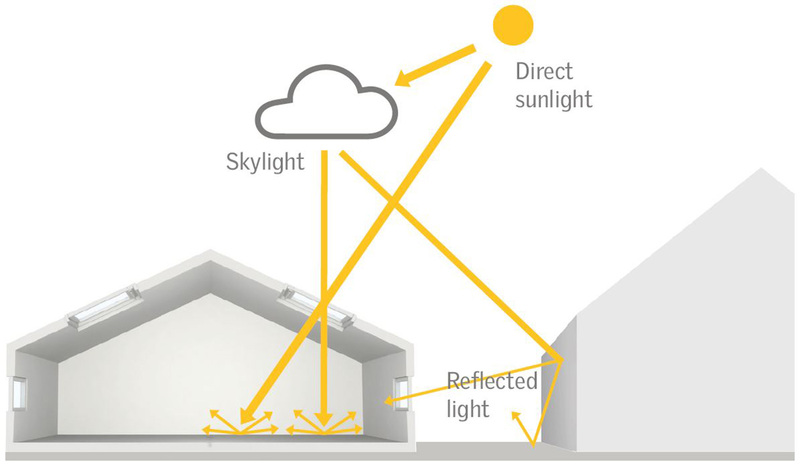 More advanced systems can be designed to track the sun or passively control the direction of sunlight and skylight. Daylighting is inseparably linked to the energy demand and indoor climate of a building. The size and placement of glazing should be determined together with the total energy use of the building and specific requirements for daylighting. Daylight in buildings is composed of a mix – direct sunlight, diffuse skylight and light reflected from the ground and surrounding elements. Light from the sun is intense and directional. Light from the sky is soft and diffuse. total daylight reaching a building facade. Lam, W. (1977) Perception and Lighting as Formgivers for Architecture, McGraw-Hill.